All dogs need to be properly taken care of in order to be healthy and to look nice. If you have a dog then you know how much of an attention they require. Their coat always needs to be clean and shiny, while their nails must be cut regularly. Even dogs themselves understand that grooming is very important, so that is why you must learn how to groom your dog at home. Grooming your dog is important and therefore it must be done regularly. Same as people, dogs require constant maintenance so they will look and feel good. Depending on the dog`s breed, their age, and overall health, daily grooming is required in most cases. However, many dog breeds do not need to be bathed constantly like humans. There are several good reasons for that. Combing and brushing are required for keeping their fur healthy and clean. With grooming, you will also learn about many sensitive spots of your dog that require gentler and more sensitive approach. You will also learn which areas your dog enjoys touching and grooming, which can become handy when your dog is under stress or before visiting a veterinarian. With grooming, you can easily notice problems that your dog might have, such as skin irritations, inflammations, swellings, or cuts. An important thing to know is that dogs that are well groomed are usually the healthiest dogs. If the dog’s hair is knotted or matted, that can lead to numerous diseases and health issues. In this article, you can learn how to groom your dog at home, so you can keep him clean and healthy at all times. Before learning how to groom a dog, you first need to get all the necessary supplies for grooming. You need to have items such as hair trimmers, tools for cleaning teeth and mouth, nail trimmers and items for cleaning the ears and eyes of the dog. 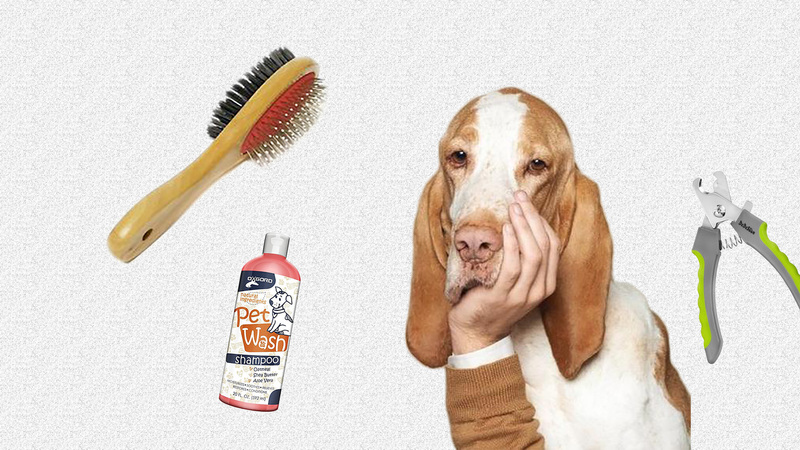 Besides these, you also need a quality brush and a special shampoo for your dog. Before the start of your grooming session, let your dog sniff the brush until it feels comfortable and learns that it is nothing dangerous. If grooming becomes a pleasant activity, then your dog will start looking forward to every grooming session. Always start brushing from the head and then go downwards towards the dog`s legs and tail. Flanks should also get good attention. Another thing to have in mind when learning how to groom my dog is to use special attention and care when grooming little puppies. Their attention span is shorter, so they require more work. Try to groom puppies when they are tired or groom them shortly, at least initially, so they can get used to it. During grooming session always try to examine the puppy’s teeth, paws, ears and their fur. Just like we need periodical examinations and need to take baths, our dogs need the same thing too. Good grooming is important for maintaining dog`s healthy lifestyle. That also translates to longer life span, so, again, groom your dog regularly. So, the main question now is how to groom your dog at home? Start by thorough brushing of your dog. Make sure you successfully untangle all the knots of hair, because you will not be able to remove them if they get wet. It is advisable to use a quality brush for distributing dog oils throughout your dog`s coat and for freeing its hair. One recommendable dog brush to use is the Hertzko Self Cleaning Slicker Brush. It is an ideal brush for removing nasty mats of the dog’s fur. It enables you to gently remove any loose hair and to eliminate trapped dirt, knots, and tangles. It penetrates deep into the dog’s skin so you can easily groom your dog`s undercoat without scratching the skin. This brush is very easy to clean and is made of durable materials. The anti-slip handle and comfort grip are perfect features that will prevent your hand or wrist from strain regardless of how long you are brushing your dog. Another great product for brushing your dog’s hair is the Pet Grooming Glove – Gentle Deshedding Brush Glove. It is suitable for dogs that have both long and short hair. This glove is a very effective massage tool as well, enhanced with a five finger design. The glove has 180 grooming tips made of silicon that give a very soft and pleasant feeling to your dog. The glove can brush away almost any kind of dirt or loose hair. Dog’s hair can be groomed gently, effectively and very quickly with this glove. Shedding hair is sticking really well to this glove, so you can easily peel it and remove it right away. Eyes. After brushing, next thing you can do is to clean the eyes of your dog. His eyes require regular maintenance, but the amount of maintenance depends on the type of dog you own. Dog’s eyes should always be clean and there should not be any discharge or irritation. Be careful when cleaning the debris from your companion’s eyes and clean the corners of his eyes by using warm water. Dogs with longer hair may require some special cleaning product for their eyes. Ears. After eyes, ears are the next thing that should be groomed. Most breeds do not like when their ears are touched and cleaned, so you may find your dog to be nervous when trying to clean his ears, at least for the first couple times. A good way for grooming your dog’s ears is to put a little bit of a cleaning solution on a clean cloth and then wipe the dirt from the inside of his ears. Be cautious and very gentle when doing this in order not to irritate your dog’s sensitive skin. You can add a few drops of alcohol for rubbing the exterior of his ears and for removing bacteria. HM tip: If you notice something out of the ordinary around your dog’s ears, such as some swelling or irritation, or maybe a bad smell, it is advisable for you to call your veterinarian because that might be a sign of some infection. Ears that are clean and healthy should not smell bad. Teeth. Next step in the process of how to groom your dog at home is cleaning his teeth. Many stats show that very few dogs have healthy teeth and most of them are suffering from dental diseases. If the tartar has accumulated on his teeth, then your dog may ingest them over time which can cause problems with its kidneys and liver. If you want to avoid such unpleasant situations, then you should make a habit of cleaning your dog’s teeth at least once or twice per week. You can easily brush your dear companion’s teeth with specialized toothbrushes. Many dogs to not like their teeth to be cleaned so be patient before they get used to the cleaning. You can also find some anti-bacterial and anti-microbial sprays which you can spray directly into your dog’s mouth for successfully eliminating different bacteria. Always use specialized dog products for grooming and cleaning in order to prevent some accidental poisoning. Never use a human toothpaste for brushing your dog’s teeth as it can make your fella sick. HM tip: For removing the tartar buildup on your dog’s teeth, you can use a normal dental scraper a couple of times per week but we would advise a visit to your veterinarian for hands-on guidance in this regard. Nails. The final step before giving your dog a bath is clipping your dog`s nails. Nails should never be neglected because they can be a source of many problems. Long nails can cause your dog problems with walking and damage his skeleton. If you have a small puppy you can easily trim its nails with a regular nail clipper, but most of the bigger dogs need clippers that are specifically designed for dogs. Always remember to trim just a small part of the nail and do that once or twice per month. For more details, please read our article on how to properly clip your dog’s nails. An optional bath. At the end of the grooming process, your dog could use a bath. If your dog is being nervous around the bathtub, you need to get a special type of leash which you can use for your dog during baths. These special leashes usually have suction cups which keep your dog still while your hands are free for washing it. Before you put your dog into the tub, always remember to remove its collar. Preferably, put its collar back on only after your dog is completely dry because if you put back the collar while the dog’s neck is still wet, your dog may get sores. Always be gentle when washing your dog and do not force your dog into the water (you might also be interested in reading our article about how to teach your dog to swim). Wait before your dog gets accustomed to getting baths, be patient. Start by washing his neck and then go down on washing the rest of his body. Use an appropriate shampoo for washing your dog. One of the best shampoos for dogs we can recommend is the OxGord Natural Oatmeal Dog-Shampoo And Conditioner – Made with Aloe Vera for Relieving Dry Itchy Skin. This organic shampoo has shown great effects on cleaning dog`s coat and skin. The shampoo is also good for the environment and provides great skin and coat treatment to your dog. It is an effective natural pet shampoo made by balancing different essential oils for best skin care and coat treatment. Bath time will become fun time with this tear-free shampoo that does not irritate or inflame the eyes of your dog. If you want the bathing session to go smoothly and without any problems, it is advisable for you to get this or similar shampoo to give proper treatment to your dog. After you are done with washing and shampooing your dog, always rinse your dog well before taking it out of the water. If you notice itchy patches on the dog’s skin, that is because some of the shampoo had not been rinsed properly. Rinse your dog with a clean water until water starts running clear of the shampoo. When your dog is rinsed properly, take it out and dry completely by using a soft and thick towel. First, let your dog shake itself and then cover it with a large soft towel. It is advised that dog’s paws should be dried quickly because that way you will prevent bacteria or fungus from forming. Dogs that have thicker coats and longer, curlier hair need more maintenance than those dogs with shorter hair. If you have a big dog with a long hair, then you can also use a blow dryer for quicker drying of his hair. However, be careful when using hot air dryer if you do not want to cause damage to your dog’s skin. Brushing your dog`s hair at the same time you are blow drying his hair is good for keeping his hair free of tangles and mats. If your dog has a curly hair remember to dry him completely so his coat will look nice and shiny.